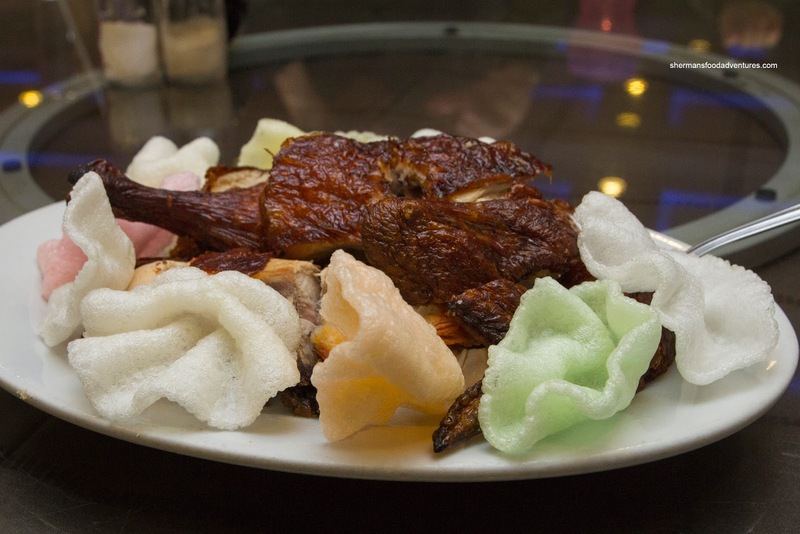 When a Chinese restaurant is filled with 90% non-Chinese customers, what would be your take? 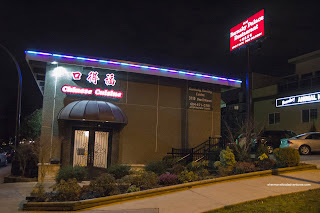 Is it: a) a Westernized Chinese joint? b) It is located in a small town? c) It's not in Richmond? d) It's name starts with "PF"? Well, the restaurant we decided to visit satisfied "A & C" at the very least. For over 25 years, Burnaby Palace has busily been serving up Chinese food, where I had apparently never felt the need to check it out. Well, after driving by it countless times, it was about time (actually I've been here before, but it was for a wake and no, I wasn't going to blog about it!!!). So I convinced my parents to join me even though my mom indicated that it wasn't exactly catered to us. Nevertheless, she actually doesn't mind Westernized Chinese food occasionally. When we arrived the place was packed and they ended up opening up the 2nd floor. We started with an order of the Crispy Chicken which arrived in a very dark shade of brown. Despite the appearance of being cooked too long, the chicken was still somewhat moist (with some dry spots). We liked how it wasn't salty either. Next we sampled an order of Sweet & Sour Pork because we knew it would be a big seller here. 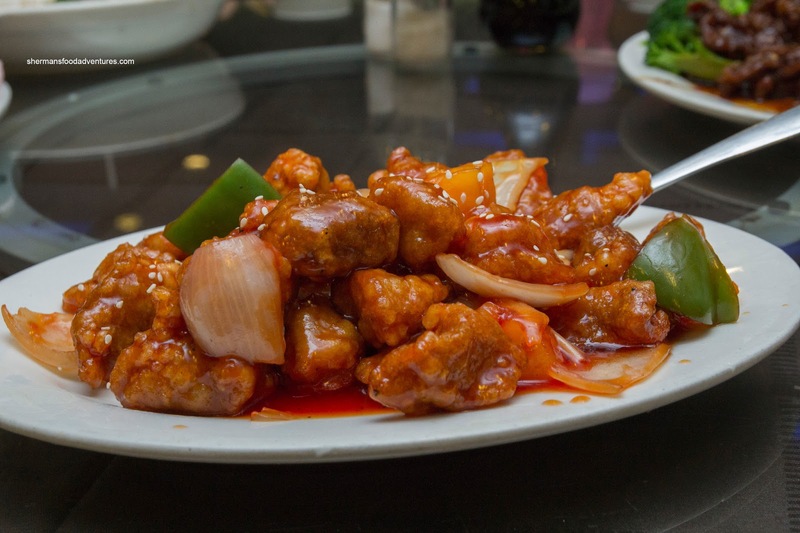 The good-sized pieces of pork were meaty with very little in the way of fat. Thus, it wasn't as moist as we would've liked, but it was hardly dry either. The sauce was on the milder side, yet balanced as well. For the kiddies, we got then the House Special Fried Noodles which were dressed with a good amount of mild starch-thickened sauce. 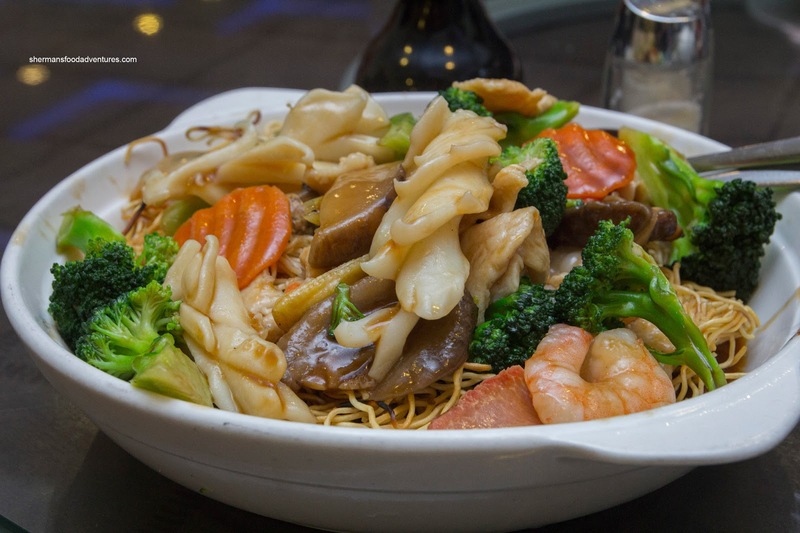 The plethora of toppings were prepared properly with tender squid, crunchy broccoli and snappy shrimp. Since they advertise themselves as a Mandarin restaurant, we opted to try the Mandarin Orange Beef. The batter on the strips of beef was crunchy while on the thicker side. The sauce was very sweet with some spiciness. There was a distinct taste of black vinegar which added a syrupy tartness to the dish. Lastly, we had the Fried Fish with Cream of Corn Sauce. 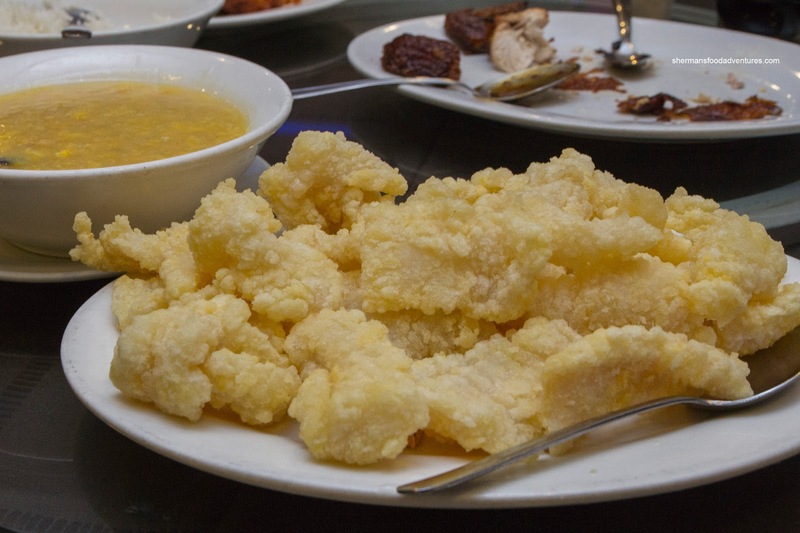 We requested the sauce to be served on the side to preserve the crispiness of the fish. It turned out to be a very light crunch on the outside, giving way to a slightly gummy batter on the inside. The fish was moist and flaky though. Not a bad finish to a relatively okay meal. Keeping expectations reasonable, there was nothing particularly bad about the food. In fact, some dishes were quite good. However, if you were looking for Chinese food that was more along the lines of Kirin and Red Star, you'd better move along. 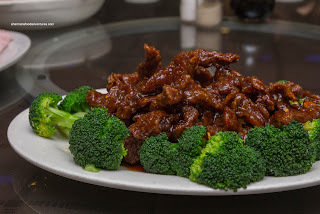 But if you desire Westernized Chinese food, then Burnaby Palace is a good option.